The University of Maine Blackbears celebrate their 68-48 victory over Hartford in the America East championship game Friday night at the Cross Insurance Center in Bangor. 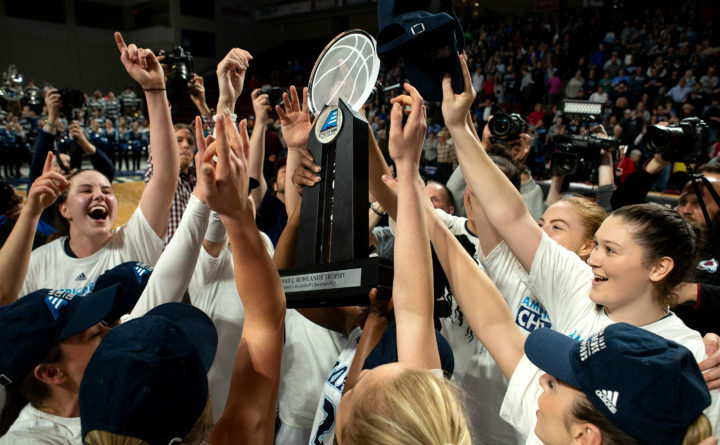 University of Maine women’s basketball coach Amy Vachon said this season’s second consecutive America East championship didn’t follow last year’s blueprint. “Last year, no one expected us to do anything and, somehow, we found a way to win a championship,” said Vachon, whose top-seeded Black Bears upended No. 2 Hartford 68-48 in Friday’s America East championship game at the Cross Insurance Center in Bangor. UMaine did not sneak up on any of its opponents this time around. “This year, everyone expected us here. That’s a different challenge, and it’s a hard challenge when you’ve never been there before. Our kids embraced it,” said Vachon, whose team attacked the season by working hard every day and not looking too far ahead. UMaine was chosen to finish sixth in the preseason coaches poll last season. This time, the Black Bears were the coaches’ unanimous pick to win it — and that’s what they did. The Black Bears, 25-7 and winners of 14 in a row, will find out their NCAA tournament regional matchup during Monday night’s NCAA selection show. Last season, UMaine traveled to Austin, Texas, and lost to the University of Texas in a first-round game. Senior forward and all-tournament selection Tanesha Sutton said being the league favorite meant the Black Bears had to stay in the moment. For graduate student Parise Rossignol of Van Buren, the title was especially sweet. The only starter from Maine, she left the program after her sophomore season and did not play during her third year at UMaine. After coach Richard Barron left the program, Rossignol returned last season at Vachon’s request. Last season, she earned the America East Sixth Player Award and a spot on the all-tournament team. This winter, she was an All-America East second-team selection. Her back-to-back 3-pointers to start the championship game ignited a 10-0 run and the Black Bears never surrendered the lead. Junior guard Blanca Millan was chosen the tournament Most Outstanding Player for the second straight year after scoring 54 points in UMaine’s three victories, including a game-high 19 against Hartford. The America East Player of the Year and Defensive Player of the Year also snared 19 rebounds, made eight steals and dished out six assists in the postseason. “I don’t know of anyone does what she does on both ends of the floor,” Vachon said of Millan, who guards the opponent’s best player but still leads UMaine in scoring. Millan said the Black Bears’ unselfish attitude is what makes their offense click. UMaine had at least four players with nine points in every playoff game and the Black Bears had five against Hartford. “They have a lot of weapons,” Hartford coach Kim McNeill said. Sutton averaged 19 points and 9.3 rebounds with seven assists and made four steals. Saar averaged 11.7 points, 5.3 assists and 3.3 rebounds came up with four steals. She committed only five turnovers in the three games. Rossignol and Fanny Wadling didn’t make the all-tourney team, but Rossignol averaged 8.7 points and scored 15 in the final and Wadling averaged 7 points and 10 rebounds. UMaine’s defense was exceptional during the postseason as it allowed only 45 points per contest. UMaine also outrebounded its opponents 124-101, went 48-for-53 from the free-throw line (90.6 percent) and had 22 fewer turnovers (27 to 49). UMaine scored 60 points off turnovers, compared with Hartford’s 17.